In the field of die casting, Kinetic Die Casting Company has been in the business for quite a long time. Over the years, Kineticdc has mastered the old and proven techniques and have found new ways on how to produce great quality die casting parts. Since 1994, Kinetic Die Casting Company has been producing great quality die casting parts and has been known for the quality and competitive price of their products. Our roster of customers includes: aerospace, military, domestic appliances, textile machinery, electrical machines, diesel engines, and automobiles among others. 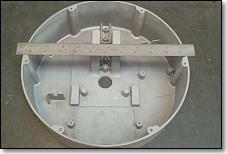 Tooling Die Casting, Tooling for Aluminum Parts. Aluminum Die Casting Parts and Aluminum Diecast in California. Kinetic Die Casting is located in North Hollywood California. We produce die cast aluminum parts just north of Los Angeles, California and two miles west of the Bob Hope Airport in Burbank / Glendale, California. on time to our customer's specifications." Diecast Aluminum Heatsinks, Aluminum Diecast Handtools, Medical Lighting Diecasting Products, Diecast Security System Card Reader and Keypad Housings, Commercial Lighting Diecast Parts, Professional Camera Diecast Parts, 413 Aluminum Diecast Aircraft Parts, 383 Aluminum Diecast Automotive Parts, Swimming Pool Accessories, Candy Machine Zinc Coin Mechanisms, Medical Product Accessories, Wheelchair Lift Parts, Housing Products, Cable System Parts, Aluminum Heatsinks, Diecast Speaker Driver Housings, Aluminum Diecastings, Home Builders Hardware Diecast Castings, Commercial Tape Backup Diecast Parts, Commercial Aluminum Sensor System Diecast Products. Spencer Die Casting Company. Spencer Diecasting History. C&D Die Casting Company. Coast Die Casting Company. Off Shore Die Casting. Renaissance Management. Die Casting Parts Save the Planet. Die Cast Aluminum Parts. Die Casting Sales. Other Casting Methods. Aluminum Diecasting Company. Die Casting Experts. National Die Casting Parts. Die Casting Business. SEO contest 2008. Sitemap. Site-Map. Privacy Statement. Monthly Newsletter. Thank You. Request Casting Prices. Die Casting Jobs. Resources and Links. 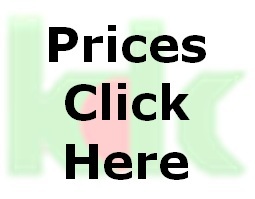 Kinetic Die Casting Links. Kinetic Die Casting Company. Diecast part sizes & diecast production capabilities. Another advantage at Kinetic Die Casting is our production and quality personnel, who dedicate themselves to producing the best die cast quality parts on time. KDC uses computer-aided production control to produce and ship diecastings to our customers on time. We will usually ship quality products in four weeks from the time the order is placed. We can expedite some die cast product shipments in less then two weeks. Our diecast machine sizes range from 130 tons to 600 tons in our aluminum diecasting machines. Our zinc diecasting machines range from 150 tons to 350 tons. 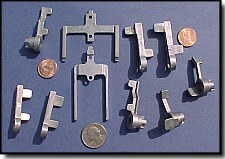 We make many types of die cast parts from less than an ounce up to a ten pound shot. We will gladly diecast any of the many alloys of aluminum or zinc or one of the special combinations. We will machine your die cast parts as necessary, paint, powder coat, polish, ball burnish, assemble, and package as you need. We will inspect our die cast production before it starts. We inspect your die cast die before it goes into the machine, to check for defects, or for broken parts in the die cast die. We inspect the first die cast parts out of the machine for flaws that may have gone unseen. We continue to inspect the die cast parts as they are die cast, and then again during the trimming and machining operations. We will perform a final inspection prior to shipment. Our customers range from COMMERCIAL QUALITY STANDARDS to MILITARY and ISO STANDARDS. All customers receive the same attention whether their requirements are high or low; they will always be pleased. "Even small parts get a lot of attention"